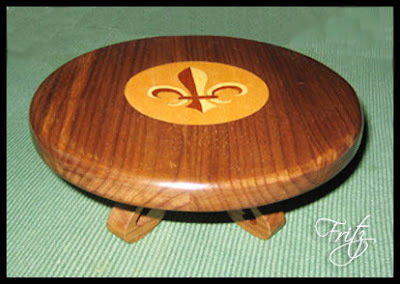 I have just finished another of your beautiful designs – and I could not resist the temptation to add to it: You can see my first attempt at marquetry, a Fleur-de-Lis made of three kinds of veneer on walnut. My wife liked it, but added the very practical comment “You’ve ruined an otherwise perfect pedestal, because now one can’t put anything on it without hiding your artwork!” My reply, that the great country manors of England are full of useless but precious pieces did not wholly convince her. Thank you, Steve for your continuous inspiration! Thank you Fritz for sending me this picture. All I can say is WOW. If this is your first try I can't wait until you practice a little. Great job. Makes my humble pattern look great. By the way my wife always keeps me grounded in reality also. Seems they are gifted in that way. 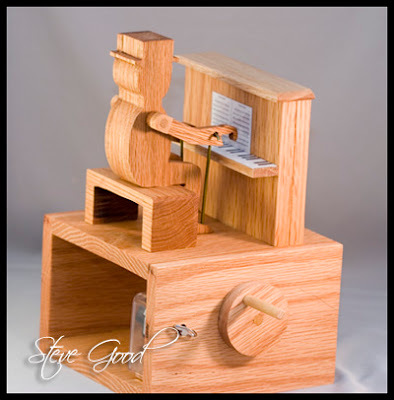 Automata Scroll Saw Pattern. The Piano Man. This is the most fun I have had designing and making a scroll saw project in a long time. Watch the videos above to see it in action. This might not be everyones cup of tea but I found it a blast to make. This is a very basic auto matron but I wanted to keep the first one easy. The assembly will be a little bit of a challenge. Take your time and concentrate on getting the movement smooth and accurate before you start gluing everything together. The videos show some construction tips but are not a step by step tutorial. Watch the videos until you are comfortable with the mechanics before you start. Take your time and it should come together nicely. The music Box is optional but it adds to the fun of the project. Look online to purchase the movement. http://www.klockit.com usually has good prices on the 18 note movements.